Dubai: Using free WiFi can definitely save you money on internet bill and what’s even better is that you can access it just about anywhere in Dubai, whether you’re at a coffee shop, hotel, mall, airport or even at the beach. However, the next time you connect your mobile phone, laptop or tablet to your favourite hotspot, be very careful. Security experts warned that while public WiFi networks can make life a little easier, they can put your personal information at risk, including the photos you save on your device, emails you send or sites you browse. And what’s worse, your credit card data can be stolen. The Telecommunications Regulatory Authority (TRA) in UAE issued a warning on Wednesday, advising UAE residents to use public WiFi with caution. 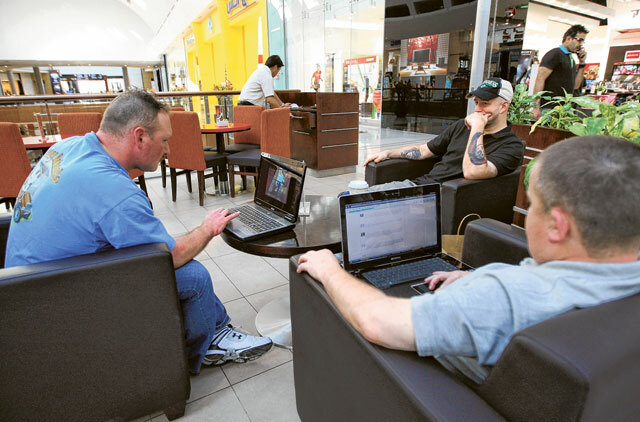 IT experts said that open wireless networks, those that are offered as a complimentary service while you’re enjoying your afternoon coffee or window shopping at the mall, are not very secure. There’s a possibility that other people can eavesdrop on your online activity. “When you connect to a public WiFi, your device can be visible to others. And if you’re accessing a website that is not secure, there are some techniques that can be used in order to intercept the message that your device is sending across,” said Christopher, who heads an IT department of a major company in Dubai. “So, if you’re shopping online, they can potentially intercept your credit card information, including password and card number, if the website you’re using is not secure,” he added. Consumers these days are becoming increasingly mobile and they expect ready access to a WiFi so they can browse the internet, post images on Facebook or Instagram wherever they are. However, since the WiFi hotspots aren’t completely secure, UAE residents would do well to connect their devices to a free network only when they are not dealing with sensitive data. Can you use VPNs in UAE? "VPNs are the absolute solution to secure your online activity in a public place, but since there are some legal issues, it's better to use free WiFi only when you're sure the website you're opening is secure," said Christopher. Nicolai Solling, chief technology officer at Help AG, pointed out that any public infrastructure can put users at risk. "[It] is, in the meaning of the word – public, and this constitutes specific issues as you may be subject to certain attacks, where attackers can inject themselves into the traffic flow of your communications,” Solling told Gulf News. 1, When using your laptop at a public place, make sure your file sharing is turned off. “When this is turned on, other people can potentially access any data stored in your device, including your personal photos,” said Christopher. 2. If you really have to access your bank account or shop online using free wireless, make sure the site you open is secure. “Look for the 'lock' symbol on the address bar. It indicates that the site is safe to use,” Christopher added. 3. Aside from sticking to trusted websites, avoid opening pages that you have been directed to via a post on Twitter, Instagram, Facebook or any other social media platform, especially when shopping online. “Attackers could use social engineering to create posts that mimic your favourite brands and online stores but ultimately direct you to malicious websites,” said Solling. “When someone offers you to the latest vacuum cleaner for 86 dollars with a 95 per cent discount in your Facebook newsfeed, it is probably too good to be true,” he added. Check the address bar. Upon closer inspection, it will be evident that the web link for a spoofed website is just a little different. Most browsers today actually deliver automated detection if a website is known bad and will alert you. Things to look out for may be a small spelling change, or registration with a different domain. This point is especially important when visiting sites on your phone as for the sake of maximizing visibility on smaller screens, smartphone browsers tend to hide the address bar unless users specifically check for this. Look out for the https connection, especially when shopping online, as all secure payment gateways use security certificates and therefore have implemented the https protocol instead of the insecure http connection. If you get a certificate warning and the web-browser is asking you if you want to proceed to an untrustworthy site it is also a good idea to think twice.